Having the right safety equipment on your boat and knowing how to use it in times of emergency may save your life. U.S. Coast Guard statistics, collected over a ten-year period, show most loss of life at sea is between shore and eight nautical miles out. One of the problems is that most of these vessels are not outfitted to survive in an emergency situation. This article will address the basic electronic safety equipment that should be on your vessel, and the benefits of this equipment interfacing with the Coast Guard’s Rescue 21 system. Rescue 21 is designed to operate in conjunction with the DSC (Digital Select Calling) VHF radio onboard your vessel. The DSC radio should have GPS information (latitude/longitude) wired into the radio from either the GPS antenna or from an operating plotter onboard the vessel. The VHF radio must have an MMSI (Marine Mobile Service Identity) number programmed into it. This number can be issued free of charge by BoatUS and others. The DSC radio has the capability, when you push the red emergency button, to automatically notify the Coast Guard on channel 70 that you have an emergency situation in progress. It will transmit your position and your MMSI number. Rescue 21, which covers the entire US coastline and the Great Lakes, will respond at that time, automatically switching your radio to a working channel. This could be channel 16, 21, or whichever they choose. They will query you on your situation and then leave you to do what you need to do. This can include such things as keeping the vessel afloat, abandoning it, or attending to a medical emergency. Next, Rescue 21 will transmit a call to all vessels in your area through the DSC system on channel 70 and dispatch the closest vessel. The Coast Guard will also dispatch their surface and air rescue craft, who will perform a position request on your vessel electronically through the DSC function and keep track of where you are at all times. This eliminates a grid search. The other vessels that they dispatched can also use DSC to determine the position of your vessel and, with the newest equipment, this will show up as an emergency waypoint on their plotter (Red Hex). They can head directly to you without running a search pattern. If the system is operating, this may mean the difference between life and death for you and your family. A handheld VHF with DSC and embedded GPS is good to have if you need to ditch. Most of these radios float and, with this capability, they’ll have the same MMSI number that is programmed in your vessel’s radio. The Coast Guard, and any vessel dispatched to you, can perform the same functions as listed above. This can make the difference between drifting around for a few hours – or even a few minutes – instead of a few days. Other potentially life-saving devices are AIS (Automatic Identification System; either Class A or B), EPIRBs (Emergency Position Indicating Radio Beacon), and personal EPIRBs (also known as Personal Locator Beacons or PLBs). 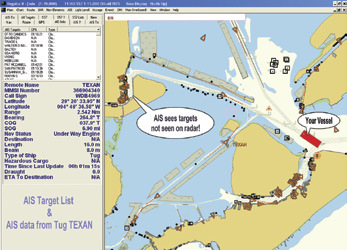 AIS transmits vessel information without any operator input. The system runs totally on its own, with the vessel’s MMSI number, name and other information programmed into its static memory. The AIS system transmits this data, as well as vessel speed, lat/long position and heading. In a rescue situation, this information is displayed on every AISequipped vessel within a 20-mile radius. As long as your AIS is transmitting a signal, rescue craft (surface and air) can home in on you. If you are out of VHF range, and you have initiated a rescue operation via satellite, radiotelephone or SSB radiotelephone, aircraft can detect the signal as far as 150 miles away from the vessel. This in itself prevents a 72-hour grid search. EPIRB and PLB signals are captured by satellites as they pass overhead, and it could take as long as 40 minutes before you are detected. Newer EPIRBs are available with embedded GPS, which gives rescuers your location and reduces the search time. In combination with the EPIRB, if more than 20-50 miles offshore, and if you have a DSC-enabled handheld VHF radio in your ditch bag, you could have the capability to talk to the aircraft once they get within range. Having the proper electronic safety equipment – properly installed – greatly enhances the probability of a swift, successful rescue. Hugh Lupo has more than 50 years of experience as a communications technician and electrician. An ABYC Certified Marine Electrician, he is the owner of Maritime Electronic Tech Training and New England Marine Electronics, both located in Norwalk, CT. For more information, visit maritimeelectronictechtraining.com and newenglandmarineelectronics.com.